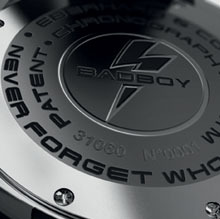 Eberhard & Co. gives its Chrono4 BADBOY a completely new and distinctive gutsy look, which will be revealed in all its explosive energy at the watchmaking world’s most important international occasion, Baselworld 2010. After having revolutionized the reading of time, thanks to the specially patented device aligning four counters, the Company’s emblem collection has become a “laboratory of ideas”, revealing a maximum expression of compactness, strength and dynamism. This is the definition of a chronograph that creates a strong and decisive impact with every aspect of its design detail. From the imposing 46mm diameter steel case to the rotating bezel with PVD-treated screws, from the screw push-pieces to the crown guard, from the thick, anti-reflective sapphire crystal to the 8 screws of the screw-down case back, ensuring water-resistance to 20atm. A particular characteristic of the Chrono4 BADBOY is its meticulous exploration of the three-dimensional and its surprising multi-level implementation of the results. Worth special mention in this context is the subtle circular metal plate mounted on the dial. Its 6 screws, emphasize the four in-line counters, and the combination of screws at intervals around the sides of the case, on the bezel, the case back and finally the flange, challenge the limits of verticality and are complemented by the tachymeter scale expressed in km. 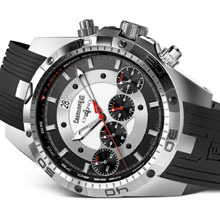 Further confirming the distinctly sporty, gutsy character of Chrono4 BADBOY are its unmistakable red features, namely the central seconds hand and the small numeral references of the counter displays that stand out proudly on the dial. Also the attractive black rubber strap, vertically sculpted, accentuates the thickness of the material and reinforces those qualities of robustness and compactness, with which Eberhard intended to endow the model. Chrono4 BADBOY  is thus truly part of the constant evolution of the projects and ideas signed “Eberhard & Co.” that, now more than ever, are coming skillfully and dynamically into focus in a chronograph of indomitable strength. Movement: calibre EB. 250 12 ½ ” – basis ETA 2894 mechanical chronograph with automatic winding Eberhard & Co. device with 4 counters in line: minutes, hours, 24 hours and small seconds – date. The complete mechanism works with 53 rubies. Case: steel, with decorative black PVD-treated screws (Physical Vapour Deposition) on the crown guard and strap attachment. Diameter of the case: 46 mm. Thickness of the case: 14,10 mm. Case-back: polished, with engravings, slightly curved on the outer edge – secured by 8 screws. Strap attachment: 22,00 mm. Water-resistance: 20 atm. Crown: screw-in, with crown guard and engraved elements to provide optimum grip; personalized with the ancient shield, symbol of the Maison, in bas-relief. Push-pieces: screw-down, with engraved elements to provide optimum grip; decorative black PVD-treated screws. - white with silvered counters and black circular zone - 24-hours counter with red hand. Shiny, with matt centre zone and snailed counters – luminescent, applique hourmarkers, either rhodium-plated or black nickel-plated. Date window at 12 o’clock - raised brand name. Red centre seconds-hand. Tachymeter scale on the flange expressed in Km. Depending on the dial version, the subtle circular metal plate features either a satin vertical or soleil finish and 6 steel screws, rhodium-plated or black nickel-plated.